Wedding Wednesday: My Favorite Puerto Rico Wedding Venues! So excited to share my favorite Puerto Rico wedding venues. If you’ve followed me in social media for long enough, you will have noticed I love weddings to be as perfect as possible for each couple I photograph, since it makes my job WAY easier (happy clients = great photos). The way to making this possible is to have educated customers, with proper expectations of their wedding. When I realized education is essential, I started looking for new ways to communicate with couples in wedding-planning mode. So, as a complement to my weekly Saturday wedding blogs, I’m launching a new blog series called Wedding Wednesday, where once a month I’ll share with you tips for your wedding from a photographer’s perspective. I will talk about anything wedding-related, so if you have any topic ideas, feel free to drop them in the comments of this blog! In this first blog, I’ll be talking about my favorite wedding venues in Puerto Rico. Venues are the first thing most couples select, making it a stressful big step, as everything else will be defined by this decision (no pressure). Puerto Rico is pure beauty compressed in an archipelago of 100×35 miles, so obviously, there are countless options when it comes to choosing a wedding venue. Puerto Rico has luxurious ballrooms, rustic haciendas, and dreamlike beaches; there’s everything for everyone ranging from big white weddings to intimate elopements. Below, I’ll categorize my favorites and talk a bit about my experience in each, and you can click on the image above the description for a full wedding in that venue. I like the outdoors. And I love about these weddings that they do not have to rely on extensive -and expensive- decor to look beautiful. Choosing to do an outdoor wedding in Puerto Rico imposes its challenges; for example, you need to have a backup plan for rain and also keep in mind the Caribbean is hot no matter the time of year. However, these weddings are beautiful and totally worth it! When thinking of a Puerto Rico wedding, many couples immediately think about saying their I do’s in front of an exotic ocean scenery while barefoot. Or maybe they want the view but not the sand situation. What I love about the following two venues, is they’re gorgeous, and you can choose to have the wedding in different (sandy or non-sandy) areas of the property. Located on my favorite side of the main Island (the West), Villa Montana is an exclusive resort consisting of individual villas facing towards the coast. Eco-friendly and pet-friendly, you’ll also feel good knowing you’re supporting an environmentally responsible local business. After getting ready in one of the villas, you will have the ceremony at their beautiful beachfront gazebo, and then have two options for your reception: one of them being indoor and air-conditioned, although my clients usually choose to have the dinner and party at the O Restaurant, a terrace by the beach. Vieques is my favorite getaway spot in the Caribbean. Being part of Puerto Rico (and the USA), it’s the perfect blend of exotic destination with the convenience of home. It has some of the best-secluded beaches in Puerto Rico, free-roaming horses, and one of the best bioluminescent bays in the world. I think I’ve made my point clear: bringing your guests here will be awesome. Add the W Retreat, which gives an exclusive, hip experience, and it’s perfect! If you’re unfamiliar with the word Hacienda, you might try estate or plantation. Most haciendas in Puerto Rico were originally houses from plantation or ranch owners, and they tend to be very rustic and have beautiful tropical gardens (read, minimal decor). There’s a ton of them, but here are my favorites. If I weren’t to mention HSA in this blog, I could just delete this post altogether. Mi Ranchito, as I call it although it’s not *my* ranch, has hosted some of my favorite weddings in my career. Every single time I have a wedding there, I see the amazed look on the guest’s faces when they first walk into the Hacienda. It’s just magical. The wow-factor is consistent through the Ceremony, Cocktail and Reception areas, and all its gardens, ponds, fountains, and terraces around the property. Hacienda Azucena is a beautiful property in the mountains minutes away from El Yunque Rainforest. It’s an ideal location for intimate weddings and elopements as it makes guests feel at home, rather than a touristy venue. The service is very personalized, and the food is fantastic. And the view from the ceremony area is stunning as well. Hacienda Don Carmelo takes pride in their horses, but I just love the greenery! Minutes away from the PR-22 highway, it’s an ideal location for weddings for clients who don't want a long drive. It has a bridal suite, a big gazebo for receptions, and a super-cute tree house. In the south of Puerto Rico, you will find the Mansion of the Serrallés family, founders of the most famous Puerto Rican distillery. Currently a Museum, this castle is beautifully preserved. They have different areas you can book for your day: a patio, the pool area, the gardens surrounding the mansion, and a recently-renovated Japanese garden with a big pagoda where you can host the reception dinner and dance party. If you host your wedding there, don’t forget to add mini-bottles of the Don Q rum to your wedding souvenirs, it’s only appropriate. As I’ve said before, my strong suit (as you may tell on my portfolio) are Hacienda weddings. I love the natural feel and look to them, plus being outdoors makes it feel like I’m not even working. Full of beautiful patios, terraces, and tropical gardens, Hacienda Campo Rico is located in Carolina, about 15 minutes from the SJU airport and the hotel district. Surprisingly, I've only done a wedding there once, and I can't wait to go back to all that botanic & architectural gorgeousness. Being one of the first colonies in the Americas, Puerto Rico has a lot of history. There are 16th-century jewels all over Old San Juan, which gives it a European look with the Latin charm. El Morro Fortress is a Spanish citadel located in the capital of Puerto Rico. Originally it was designed to guard the entrance of San Juan from seaborne enemies during colonial times. Surviving the test of times and changes in the history of the Island, it is now part of the US National Parks Service and the seventh-oldest building in the United States of America. Its beautiful 16th-century architecture overlooking the Atlantic Ocean makes it a dreamlike location to exchange vows, and it’s my favorite place for elopements in Old San Juan! If you or your guests are not so fond of the heat, or you want to have peace of mind regarding the weather on your wedding day, there are also beautiful ballrooms to celebrate your nuptials. My favorite I’ve worked at so far is Casa de España. Built in the 1930’s, this iconic venue with beautiful Moorish-inspired architecture was planned as the headquarters for Spanish descendants in Puerto Rico. As some of the properties in this list, Casa de España is part of the National Register of Historic Places ever since the 1980’s. Nowadays, it is one of the most famous venues for private events in Puerto Rico. It has a gorgeous patio, rooftop areas, and the beautiful mirrored ballroom where most receptions are held. 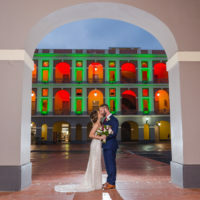 Its convenient location also helps if you want your newlywed photos to be captured in the streets of Old San Juan, although there’s no need to get out of the premises for beautiful wedding photos. This venue, a former casino located in the heart of Old San Juan is listed in the National Register of Historic Places. It has a gorgeous Beaux Arts architecture and hosts some of the most exclusive events in the Island. Although I’m an outdoorsy breed of photographer, this venue has big, bright, breezy windows, white walls, marble floors and golden accents. This is enough to have my heart singing. The ability to get discounted accommodation rates for event guests, and the ease to have most of the services included in the venue booking, make hotels some of the most convenient and sought-for venues for weddings in Puerto Rico, especially for a Puerto Rico destination wedding. Honestly, every wedding I’ve done at La Concha looks different and beautiful. They have a ton of areas and ballroom options for ceremonies and receptions alike, and the hotel is located in Condado Beach, which makes for a perfect tropical-newlywed-photo-spot. The food is fantastic, and their service even better. The hotel has a sleek and trendy look that is preferred by many contemporary couples. I’ve shot some of my favorite weddings in this hotel. Designed by the same firm of the New York City’s Grand Central Terminal, you’ll find the hotel to have a fantastic Spanish Revival architecture! I’ve found the Vanderbilt staff to be one of the most accommodating and helpful, providing an amazing wedding experience for couples, guests and vendors alike! It just screams luxury wedding all over, and it’s beachfront so you can easily get some outdoor photos as well. This list was based on my experience, so I only talked about places I’ve worked at during these past eight years. This list might change as I continue growing in the industry since there are a few places I’m dying to shoot, but I haven’t yet! This segment is a big *HINT, HINT* for you all: are you planning a wedding in here? I’ll be extra excited to capture your day. I’m an art and architecture lover. Mix those two with a wedding, and you have a happy Camille. I’ve seen a couple of weddings in this Museum, and they are To. Die. For. You can get married in front of the entrance of the Museum, and then have the party in the plaza inside of the Museum. I have no weddings booked yet for this venue. Will you be my first? This authentic early colonial-style museum was closed off for a long time. It re-opened recently, and besides being a nice attraction during your vacations in Puerto Rico, it is also an amazing, non-cliche venue for small weddings! Can't wait to capture weddings there! Well, I hope this list was helpful! In the next Wedding Wednesday, I’ll be talking about engagement session location ideas in Puerto Rico, as this is one of the most frequent questions I receive after booking. Is there something you want me to talk about in a future Wedding Wednesday? Share it in the comments below!